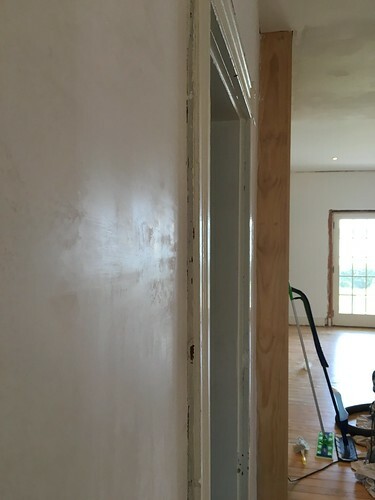 Traditional plasterers achieve perfectly flat and smooth walls with nothing more than a trowel...no sanding required. Yes, you heard me, no sanding at all! For years I've used what was readily available to achieve the "plaster" look. At this point I've probably applied close to 300 gallons of joint compound to give our walls the authentically vintage look of plaster. I've also discussed this somewhat labor intensive and messy method at length, which included the many MANY references to sanding it all smooth until my arms could sand no more. 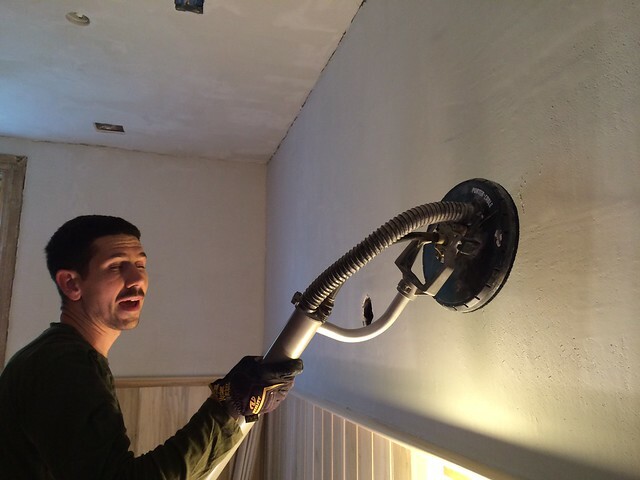 Over the years I adopted techniques to ease the process, tools to reduce the mess, dust collection methods to keep the drywall dust from venturing into each and every nook and cranny in the house. But no matter how good I got, it was always the same: apply, sand, apply, sand, apply, sand, repeat until you cry out to the wall "I have a bad mustache and I just can't take this any longer!" Your situation may be different than mine, but you get the idea. The only thing more shocking than the amount of sanding that's necessary with joint compound is the number of spousal disputes this especially fine layer of dust has generated. I can't tell you how often I was asked "did you tape the door, use filter bags, use a HEPA filter, and clean up before you came out of the room where you were sanding?... Then why in the hell is there a layer of dust over everything?" After always answering the same, "because there's just no way to control it!" 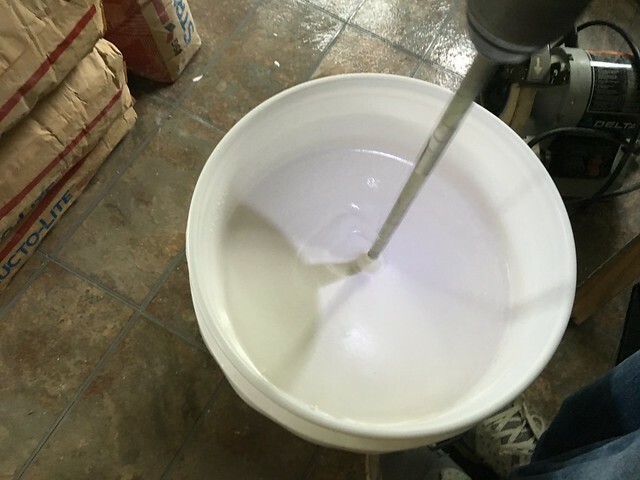 I was more ready than ever to figure out the right way to achieve what we wanted without all of the mess, inconvenience, and clean up associated with sanding joint compound. 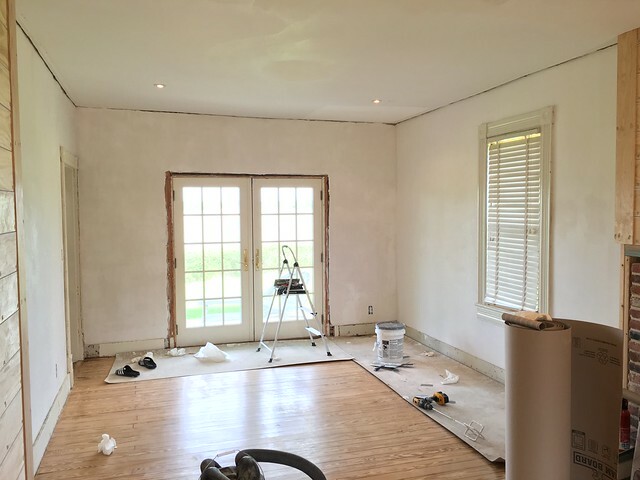 Back in January I started to post about working with Master of Plaster lime restoration plaster in our new house's living room. 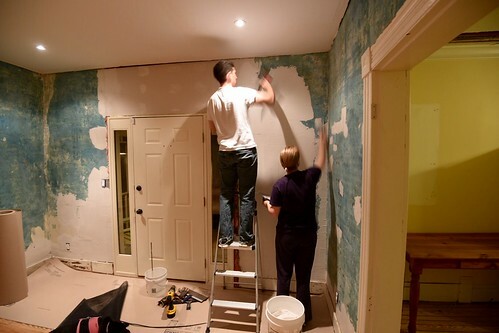 To this point I've covered the two layers of base coat plaster we've applied to the living room walls. The first was a layer of Structo-Lite plaster with an embedded fiberglass mesh. The second was a layer of lime based Master of Plaster restoration in their base coat formula. 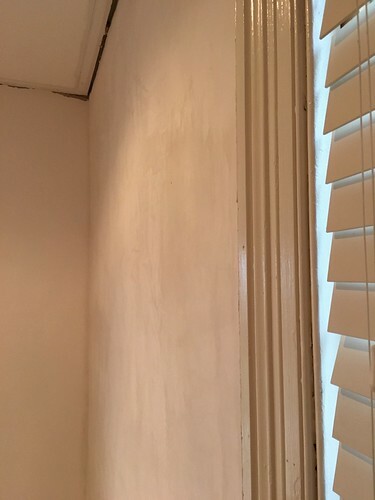 This gave an exceptionally smooth covering over the entire wall with no sanding, but still with a bit of a rough "tooth" to accept a final finish coat of plaster. Our final step in plastering this rather large room was to apply an extremely thin and fine layer of Master of Plaster finish coat over the entire roughly 500 square feet of wall space. 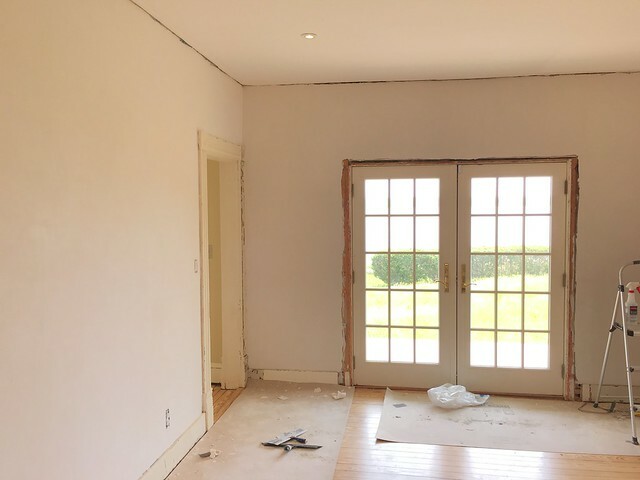 The hope at the end of this endeavor is to have a perfectly crisp and smooth traditional lime based plaster wall, fully restored and ready for paint with absolutely no sanding at all. After allowing the base coats to fully cure, the finish coat of MoP is ready to apply. The bucket of finish coat is set off from the base coat by its gray lid. But the real difference is in the consistency of the material. Just like the other material, it needs to be mixed before use, but the mixing is much easier because it's so much looser. Where the base coat seems like a soupy wet sand consistency, it can still hold its form decently. However, the finish coat is much more of an extremely loose pancake batter. You know, when you put too much water in the pancake mixture and you get really flat pancakes? That's how loose this is. 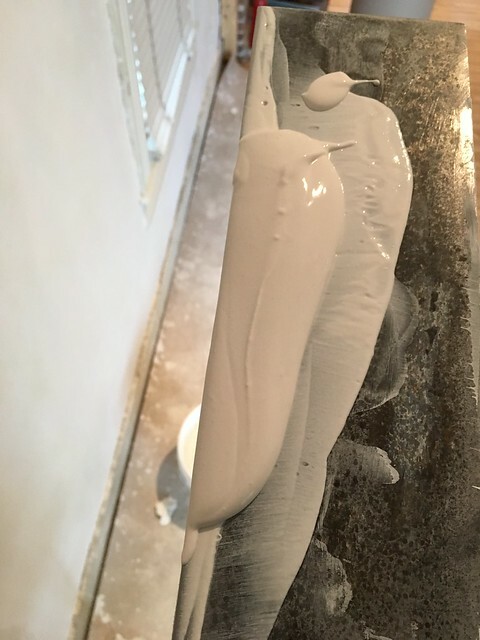 There's no grit to the finish coat like there is with the base coat (that's the mica in the base coat), which is what allows it to go on so smooth. 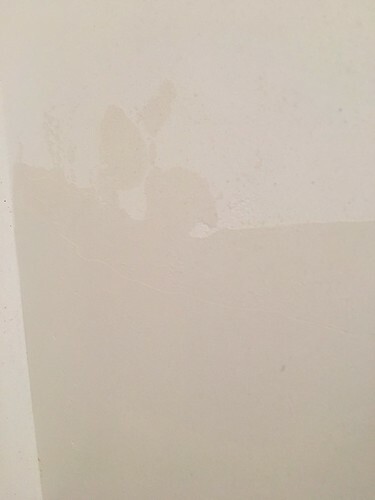 My technical contact at MoP actually told me she was excited for us to get to the point of applying the finish plaster because it goes on "like onion skin." This was enough to get my plaster nerd heart racing. I'll tell you one thing, she was 100% correct! The photo really can't do it justice. The most important thing I learned very quickly when working with the finish coat is simple, don't try to put too much on your trowel. I got to the point where I was just more or less slapping the taping knife in the finish bucket and then scraping that onto the trowel. Any more than that and I risked having it slide off of the trowel and onto the floor. Then it was just working quickly to get the finish coat as smooth as possible. As soon as it was all spread smooth, I'd grab a little more on the trowel and move on. The other most important thing was to make sure I had one some killer Adidas sandals and black socks at all time. It made me feel way more competent. By comparison, the whole room took a little over six 5 gallon buckets of base coat to cover everything. 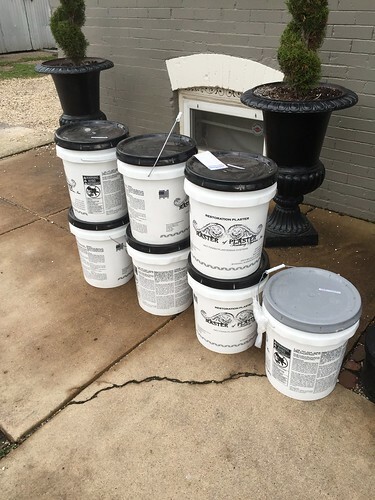 The finish coat over the entire room will take just a little less than one 5 gallon bucket of the finish plaster! 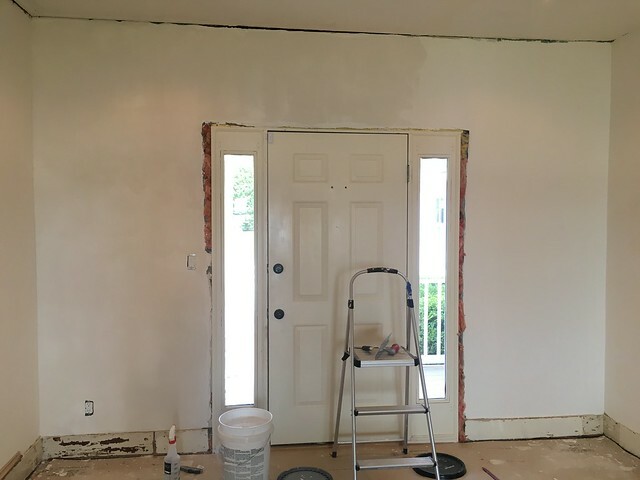 But the big question, was I going to be able to accomplish my goal of a nearly perfectly flat and smooth plaster wall without the need to sand? Back when I was researching Master of Plaster I read the guidance on the products, and took special note of the "no sanding required" aspect. It intrigued me and worried me at the same time. I was concerned I wouldn't be capable of producing the surface I needed without sanding. My own self doubt and knowledge that I've spent the better part of a dozen years sanding walls until I couldn't lift my arms. How could I possibly achieve this goal? The answer ended up being pretty simple...YES! Pretty amazing given where we started. The key here was to apply the finish coat in somewhat small sections, maybe four feet by four feet, and then immediately circle back with the spray bottle to spritz the wall and smooth out anything that's not really flat. Continued troweling and spraying smooths everything out so much that the finished surface looks so smooth it shines. Earlier I had waited too long to spray the wall and it let the plaster set up too much, which made smoothing it much harder. As long as I kept spraying before it was too dry, we were golden. The other important thing I learned was to work from the top of the wall down. The water from the spray bottle, no matter how hard you try to prevent it, will drip down the wall in places. Working from the upper part of the wall down will keep those drips from running through already completed sections. All told the finish coat proved to be the easier of all of the coats of plaster. It goes quickly and smoothly once you get into a rhythm. 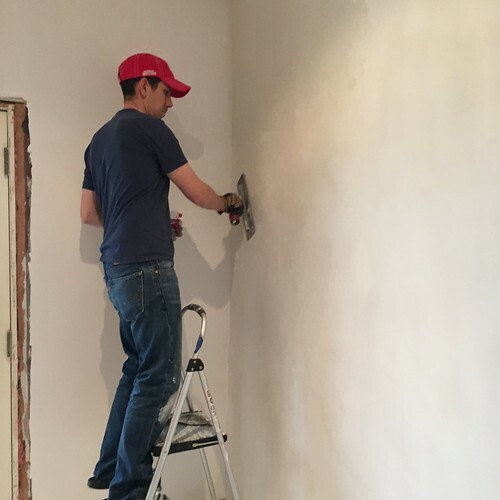 And when all is said and done, you're left with an almost perfectly smooth wall with crisp lime plaster and absolutely no need at all to sand out any imperfections. This was a breathtaking thing, let me assure you. The mess is almost nil, the effort reduced, no more pushing the pole sander against the wall, my shoulders and back screaming, while the whine of the shop vac struggling to keep up with the endless flow of ultra-fine dust cries out in the background. Instead I joyously hummed along to whatever I happened to be playing on the Sonos in the other room, giving my nervous twitch from the mess that stems from sanding a nice rest. In the end I couldn't be more happy with the end results of Master of Plaster's lime restoration project. It's given me a new level of confidence when it comes to patching and properly restoring lime plaster. While this material is certainly suitable for and used by many professionals, it's also a very DIYer friendly product. 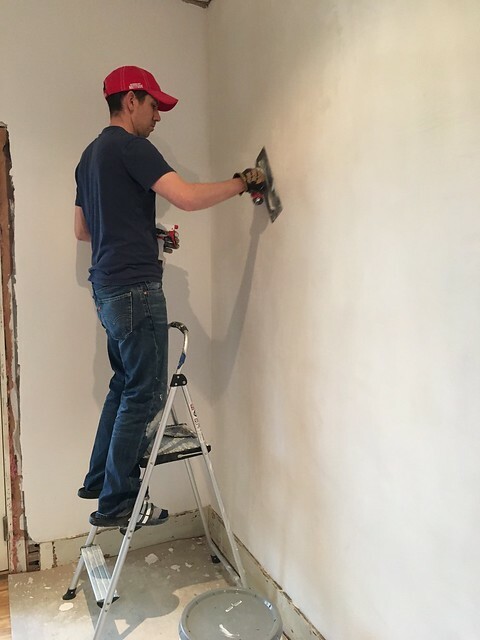 The most important things to remember are to work in small sections, use the spray bottle to smooth, and don't try to load too much up on your trowel at any given time. Nearly our whole house has paster walls in need of some level of help, whether extensive like this living room, or more minor like the bedroom ceilings, and I think the thing I needed most was the confidence to know we'll be able to tackle these issues in each room no matter how severe they may be. And best of all, without sanding. In my opinion the MoP plaster restoration system beats the pants off of using joint compound to fake the look of plaster. It's easier to work with, gives a better finish, is more historically accurate, and is well suited whether your house is historically significant or you just want beautiful plaster walls. Our next steps in this room will be the finish molding, some painting, installing the light/fan fixtures, build a new mantel, and then we can move our furniture in! After our long effort to get this room done, we can't wait until it's a great place to relax. It's a huge room and it will make us feel like it's in an entirely different house! This blog post and project was done in partnership with Master of Plaster. Master of Plaster supplied the base and finish coat plaster but all experiences and opinions of the restoration plaster product are our own. For more details on Master of Plaster, and for information on how to purchase, please visit the Master of Plaster website. It looks fantastic. Great work! "the MoP plaster restoration system beats the pants off of using joint compound to fake the look of plaster"
Does this mean you're going to redo the walls you did with joint compound? Looks great! I can definitely relate to your joint compound/sanding stories. This looks like a nice alternative! Wow! Is this a lucky house! Been reading for quite a while, but after todays post I finally had to comment on what great owners you are. I think that houses have souls and you are curtailing making this house happy! So glad you found it! Do you know the estimated costs for the restoring you did with MOP? It seems like a huge amount of product. Looks amazing. I enjoyed your video on putting the finishing coat. It looks pretty smooth. I am a professional handyman and painter in London and for some reason I can't ever seem to get the finishing coat smooth. I almost always have to sand it after. I like your technique of little bits at a time. I might give it a try. My other skills are pretty good, but definately need some more plastering practice. We just bought a 1925 home with plenty of old plaster & lath walls! I've been reading your blog a ton in preparation to tackle one of the bedrooms which will become a baby's nursery. The plaster has cracked in a few locations, including around a former doorway and former window, both of which were closed-in sometime in the 1980s or 90s. (So in these areas, I think we have traditional drywall or gyp board under a few layers of bad plaster.) I'm thinking of smoothing all of this out by sanding, then skim-coating (and repeating as much as possible). Do you recommend a primer/sealer coat at any point in the process? I didn't see that you used a primer in any of your steps or projects. Thanks in advance! Just wanted to let you know that your trials documented here have helped me tremendously as I restore some walls in my 1914 home in Minneapolis. I went with MOP and could not be happier. I'm almost to the final coat. Thank you!